SKT avenge their 2018 misfortune with a dominant display over the regular season champions. In one of the most highly-anticipated finals in League of Legends history, SK Telecom T1 refused to let the series reach five games. SKT restored their dynasty after taking down Griffin in an epic 3-0 sweep to secure their seventh LCK championship and a spot at this year’s Mid-Season Invitational. Griffin, meanwhile, have to go back to the drawing board in search of that elusive first championship. The first game looked poised to be a massive statement from Griffin as all five players, including a Taliyah-Pantheon bot lane, burst down Cho “Mata” Se-hyeong even before minions started and surged to an early 1,000 gold lead. An Infernal Drake dropped into their pocket as well as two turrets at the 15-minute mark to improve this early lead—the only beacon of hope for SKT was an Infernal Drake of their own and a singular kill. But the six-time LCK champions came back into the fight with a climactic battle around the third Infernal Drake, which halted Griffin’s momentum. The first seed restored that momentum with two Mountain Drakes and the Baron as they slowly inched ahead, but SKT won a crucial fight at 35 minutes and then snagged the second Baron. With Baron, SKT had the edge to win only their second fight of the game—but it was enough to charge down the mid lane and blow up Griffin’s Nexus for a 1-0 lead. While Griffin got the early kill in game one, SKT were too smart at the start of the second game as Kim “Khan” Dong-ha’s Akali and Kim “Clid” Tae-min’s Jarvan IV picked up two kills after SKT outnumbered Griffin around the red buff. Clid visited Jeong “Chovy” Ji-hoon’s Lissandra in the mid lane to send the LCK regular season MVP to the grey screen for a second time in the first five minutes. Griffin salvaged a kill of their own onto Mata’s Galio, but they were already down 1,000 gold by the 10-minute mark. Another fight put more kills and more gold into SKT’s pockets as they slowly pushed the second game out of Griffin’s control. By the time Griffin limped to the 20-minute mark, they were down 5,000 gold, three turrets, and seven kills—and the writing was now definitely on the wall. Lee “Faker” Sang-hyeok and the rest of SKT slowly chipped away at Griffin’s defenses before overwhelming them in a teamfight at the 29-minute mark to open up the base for another victory. Despite facing match point, in an eerie echo of the first game, Griffin again picked Sylas, Taliyah, and Pantheon in their first rotations of the pick and ban phase—they were seemingly determined to prove the “Avengers” bot lane duo (as termed by LCK caster Nick “LS” De Cesare) was viable. But SKT responded by returning to parts of their game one composition with Faker’s Ryze, as well as Park “Teddy” Jin-seong’s Ezreal and Mata’s Braum. And it was nothing but a bloodbath as Teddy picked up the first kill of the game again, and Griffin relentlessly laid siege to SKT’s bot lane in a desperate attempt to get Park “Viper” Do-hyeon and Son “Lehends” Si-woo ahead. But the repeated efforts of both Lee “Tarzan” Seung-yong and Chovy failed to yield anything but a few tower plates as the second kill of the game also went SKT’s way after Clid shredded Tarzan’s Elise to send the crowd at Jamsil Indoor Stadium into monstrous cheers. 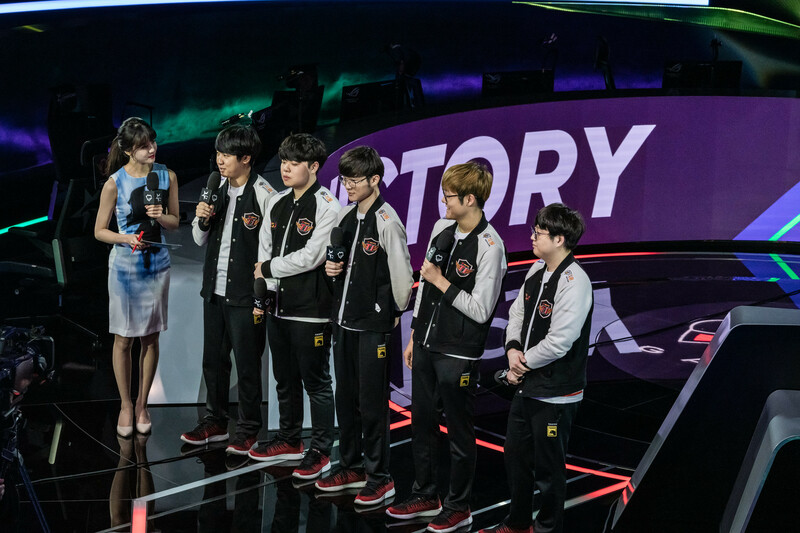 Griffin showed signs of life as they were willing to brawl with SKT, but in every fight, the series leaders inched ahead and accumulated advantages all over the map. Down 7,000 gold at 29 minutes, with even the casters calling the game and the series over, Griffin made one last desperation play—but Faker, Teddy, and SKT wiped them off the map to return to the top of the world as the 2019 LCK Spring Split champions. With this win, SKT will eagerly wait as the rest of Super Saturday unfolds to see who they’ll be battling against at this year’s Mid-Season Invitational in Vietnam—LCS teams TSM and Team Liquid will do battle later today, while Fnatic and Origen duel for the right to face G2 Esports in the finals of the LEC. The LPL finals are also rapidly approaching as JD Gaming took down first seed FunPlus Phoenix, and now await the winner of Topsports Gaming and 2018 world champions Invictus Gaming in the final.